Pacman: Behind the Scenes with Manny Pacquiao–The Greatest Pound-for-Pound Fighter in the World (Da Capo, 2010) is the critically acclaimed biography of Manny Pacquiao. Not only has Emmanuel Dapidran “Manny” Pacquiao won eight different titles in eight different weight classes and been named the fighter of the decade, the PacMan is a cultural icon and congressman in his native Philippines. The controversial book is a tour de force through Pacquiao’s 32 years of existence, an extraordinary life that is filled with heart-stopping action inside the ring, as well as an equal dose of poignancy and hilarity outside of it. The Wall Street Journal has called it “superb,” the South China Morning Post says it is “brutally honest” and it has been recommended as a top 2010 book by the Los Angeles Times, The Guardian, and the Observer, and it has received raves from Sports Illustrated, New York Newsday, the Dallas Morning News, and other publications. 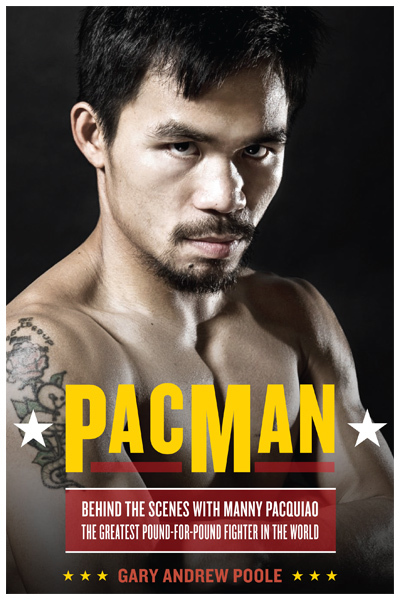 PacMan: Behind The Scenes was also excerpted in The Ring and The Atlantic. To report the book and tell Pacquiao’s compelling story, I did something I call journalism-by-hanging-around: I interviewed Pacquiao and dozens of sources, and I also spent time ringside watching him fight, observing him in his training camp, eating meals with him, visiting his haunts in Manila (and interviewing people there), and avoiding kidnappers in the coconut jungles of the southern Philippines. Good times.